At wedotanks.com®, (f/k/a HTI Systems, LLC) we specialize in precast concrete tanks and construction methods for wastewater treatment plants and components, including septage tank design, and the manufacture of holding tanks for septage and sludge. Over twenty years of experience in the wastewater treatment industry have helped make wedotanks.com® the experts in septage tank design, construction, installation, permitting, and septage treatment systems. Whether you are a municipality or a private company, wedotanks.com® can work directly with you to design and implement a septage treatment plant or septage treatment package to suit your custom needs. wedotanks.com® staff can also provide septage tank permitting services, and septage treatment plant permitting services, working directly with your local city, township, or county to smooth the construction process. Call wedotanks.com® and let the pros help get your septage treatment plant underway and keep it on schedule. Strictly defined, septage, or sludge, refers to the waste, refuse, effluent, or any other materials removed from any part of a sewage disposal system, such as cesspools or holding tanks. Septage may include sediments, water, grease, scum, or other biosolids. 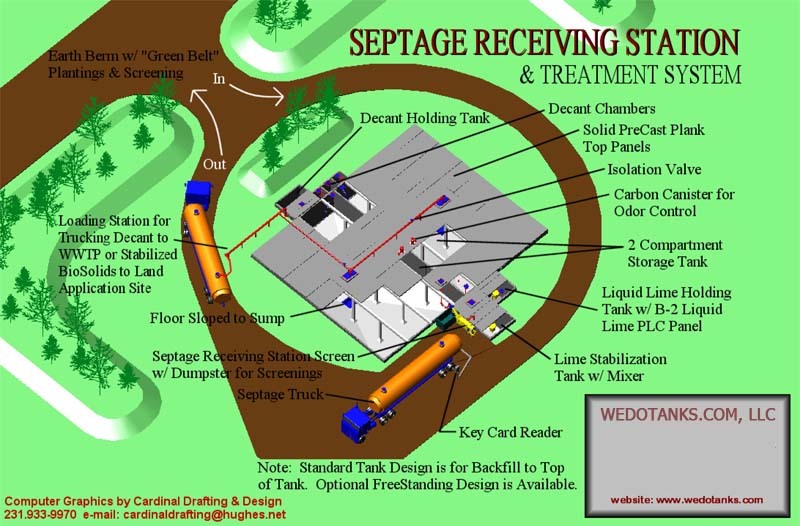 Septage is generally treated at a wastewater treatment facility, or an independent septage treatment plant. Two methods of septage treatment are aerobic digestion or anaerobic digestion of biosolids. In either method, a septage tank is used for holding septage or sludge for a period up to 30 days while the septage is treated. wedotanks.com® septage tank designs are trusted by business owners, municipalities, and commercial enterprises, who count on dependable septage tanks for their day-to-day operations. With wedotanks.com®, you have a company that can custom design a septage treatment tank, or septage holding tank according to size and flow specifications that will perfectly match your septage treatment specifications. At wedotanks.com®, our process features turn-key wwtp packages: we perform septage tank design, septage tank construction, septage tank permitting, and septage tank installation. wedotanks.com®’s precast concrete septage tanks are known for their dependability and long life. The septage tank design includes strategically-placed seams which are filled with an industry-approved sealant provided by a member of the Chevron Family of Companies. This sealant and the septage tank itself is 100% environmentally friendly. wedotanks.com® helps their clients get the right septage treatment system by offering one of the broadest arrays of custom specifications in the industry. We understand that whether you need a smaller septage tank for a housing development, a septage holding tank upwards from 300,000 gallons for a wastewater treatment facility, municipal septage system permitting, or municipal septage system construction, you want professional, experienced help, and the highest quality septage tank you can get. Please take the time to view the rest of our site, and then contact us. Let wedotanks.com® help you get your wastewater treatment project – including septage holding tanks – up and running smoothly.